This time I only allowed myself about 10 minutes to work on this sketch, so I spent a lot of it trying to bring out the unusual things about Sherlock aka Benedict Cumberbatch’s appearance. First, of curse I roughed in the basic shape, face and hair and that ridiculously long, well-postured neck of his, and then I concentrated on the unique shape of his mouth, the Cupid’s-bow upper lip and full, squarish lower lip. The eyes are his other most striking feature (well, after the cheekbones), and one of the hardest to capture. His nose got sort of roughed in and left there, I’m afraid, but it does all right. I think the drawing would benefit from another five minutes, but the point of the exercise was to get something recognizable as the actor in a short amount of time, and I like to think I’ve succeeded. 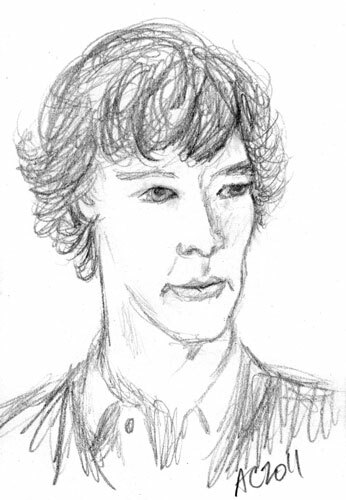 Sherlock sketch 3, 2.67″x4″ pencil on notebook paper, nfs.